It sounds like a simple question that ought to have a straightforward answer, but both the question and its answer are far more complicated than they appear. 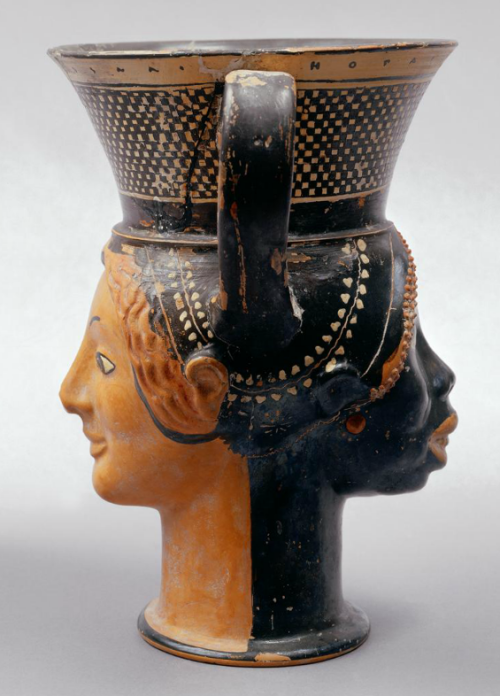 In this and some upcoming posts, I’ll dig into the topic to explore what we know, what we don’t know, and what we mean by race in the ancient Mediterranean world. As simple as it may sound, almost every word in this question hides layers of assumptions. It assumes that race is a valid category for describing human beings, and is equally applicable to ancient societies as to modern ones. It assumes that we can reconstruct ancient demographic information in some comprehensive way. It assumes that “Ancient Greeks and Romans” are definable groups of people, and that we know who we mean by that designation. These are not trivial issues, and I’ll take them up in future posts, but today I want to address an even more fundamental and persistent assumption: that the racial identity of the ancient Greeks and Romans matters. Now, I am an ancient historian and a geek. I’ve spent my entire life, both at work and at leisure, being told by people that the things I care about don’t matter. (The title of my field, “ancient history,” is even used as a synonym for “irrelevant.”) That’s never stopped me from trying to figure things out and it shouldn’t stop us from thinking about race in antiquity, but it should make us step back and ask: Why do we want to know? When we ask questions about the race of ancient peoples, we are not posing these questions in a vacuum. There is, in fact, a long history of people arguing about the answer, and if we don’t understand their reasoning and motivations we may fall into the same traps and make the same mistakes that they did. We can start around 1500 CE when the Western concept of race was taking on its modern contours. Variations in physical and genetic features—from skin color to blood type—are part of the reality of human biology, but the belief that these features can be used to divide humanity into distinct and meaningful categories, along more or less the terms we recognize today, was a product of European imperialism and colonialism. The European powers that were busy conquering and colonizing the rest of the world had to define themselves as superior to the people they were displacing, exploiting, or massacring. The idea of a “white” race—a superior “white” race, no less—began with the need to justify European activities abroad. Once Europeans had defined themselves as both white and superior, history had to fall in line. On one hand, the roots of white superiority had to be found in the depths of history; on the other hand, any great accomplishments in history had to become the property of white people. Any evidence that could be interpreted as suggesting that white people had made significant achievements before anyone else were celebrated, such as Piltdown Man, a hoax that got out of hand because it conformed so perfectly to what archaeologists expected: the crucial first steps towards modern humans happened in northwestern Europe. The achievements of non-European peoples were denied or claimed for Europeans wherever possible, like the “dynastic race theory” in Egypt or the assertion that major centers of African civilization like Great Zimbabwe must have been built by white (or white-ish) settlers. Civilizations that could be neither denied nor claimed for whiteness, like those of ancient India, China, and Mesoamerica, were denigrated or dismissed. European Christian culture had long idolized the civilization of ancient Greece, a habit that went back as far as the Roman Republic. The Romans had had an uneasy relationship with their Greek neighbors and subjects, as they tended to elevate the great literary, artistic, and philosophical works of the classical Greek past while sneering at contemporary Greeks as unworthy of their ancestors. After the fall of the western Roman Empire, as Greek and Latin became learned rather than vernacular languages, Greek and Latin literature collectively acquired an aura of cultural authority. This aura of authority was further supported by the association of Greek and Latin learning with religious authority in the Christian church. By the imperial age, when European nations were asserting their racial superiority over their colonial subjects and slaves, ancient Greek and Roman civilizations had come to be perceived as the peaks of intellectual, philosophical, and artistic culture. A defense of European superiority therefore required the assertion of a direct link to Greece and Rome. Since race was the accepted currency of identity, that link had to be defined in racial terms. It therefore became essential that the ancient Greeks and Romans should be white. Various strategies existed for making the argument that the ancient Greeks and Romans were white, but one of the most influential was the Aryan invasion model. According to this model, the Aryans were a primordial superior white race whose origins lay somewhere in northern or northeastern Europe. At various times in history, individual branches of this race would explode outwards, traversing great distances and conquering all the “inferior” peoples in their path, eventually colonizing a swath of Eurasia stretching from England to northern India. These Aryan invaders could be credited with cultural achievements anywhere they went, but most importantly they were hailed as the ancestors of the classical Greeks. Western and northern Europeans who claimed descent from other branches of Aryan settlers could therefore claim an ancestral connection to the glories of Greece and its Roman successors. It was not enough for the ancient Greeks and Romans to be white. Since Europeans looked back to Greco-Roman culture as a source of authority, those who wanted to validate imperial projects required that the opinions of the great ancient authors should support their sense of racial superiority. Scholars searched ancient texts for passages congenial to the imperialist drive and elevated these as the true beliefs of the Great Thinkers of antiquity. Any passages which expressed a different perspective were dismissed or reinterpreted. Through the centuries of this scholarly activity, the ancient Greeks and Romans became not only “white” but the very founders of white supremacy. Modern scholarship recognizes that the “Aryan race” was a figment of the imagination (the term “Aryan” is now reserved for certain historical peoples of northern India). Both the ethnic identity of the ancient Greeks and Romans and their opinions about that identity are now seen to be far more complicated issues with no easy answers, but the insights of the past several decades of scholarship are only slowly coming into wider public consciousness. The relics of the racially-determined Aryan invasion model are still all around us, some of them stripped of the most obvious racism of the older scholarship but still grounded in the urge to assert the fundamental whiteness of the ancient Mediterranean. When we ask questions about the race of the ancient Greeks and Romans, this is the context we must be conscious of. Much older scholarship is suffused with its ideas, and even more recent popular discussions of the subject tend to be unknowingly aligned with the Aryan model. The mistakes of the Aryan model and other arguments that asserted the whiteness of the ancient Greeks and Romans arose from the desire to made the past reflect the concerns of the present. The past does not exist to make us feel better about ourselves or validate our contemporary politics. This is the assumption we must guard against most carefully in any historical research. If we assume that the Greeks and Romans are a measure of civilization and that any similarities we can find between ourselves and them prove our own worth, our arguments will go hopelessly askew. Instead, if there is any use in examining Greek and Roman ethnic identity, it is as part of the larger work of history: to help us understand our own society better by giving us useful examples for comparison. We will not prove our own value by showing that the Greeks and Romans were like us, but we may better grasp the complex forces at work in forming our own identities by understanding how they were different from us.